Bloodshot Reborn #1 | DestroyTheCyborg! Bloodshot Reborn #1 – DestroyTheCyborg! For a comic book publisher that largely lived and died in the nineties, there was always the concern that Valiant Comics’ revival in 2012 would result in a cultural artifact, one forever stuck in the era of boy bands, dial-up, and an insatiable urge to “catch ‘em all.” Yet Valiant defied those odds, set their sights on creating a varied set of titles, as well as attracting first-rate talent to work on said books. Surprisingly, it worked, even without a “big two” catalog of established characters that readers were already accustomed to. So what attracted new readers to this foreign universe of sentient armors, goats wielding heat vision, and Caucasian ninjas that don’t live in a van, down by the river? Surely most comic book fans, their brains already bogged down keeping track of umpteen Robins and the ever-increasing enrollment at Xavier’s School for Gifted Youngsters, couldn’t free up shelf space in that cranium of theirs for additional “big two” canon, save that of another universe. Okay, so sometimes Quantum and Woody is about brotherhood…and other times (a lot, to be exact) it’s stuff like this. Personally, I’d attribute Valiant’s both enduring and newfound appeal on the human element that resonates at the core of their tales. X-O Manowar, for all its sci-fi trappings, remains a story of a stranger in a (somewhat) strange land. Quantum and Woody, for all the goofiness and double entendres, addresses the complicated issues of familial legacy and sibling rivalry without the cloying heavy-handedness of “serious” titles. Archer and Armstrong asks what happens when you pair an immortal man that has seen (and/or done) anything and everything Earth has to offer, with a naïve teenager who’s rarely wavered outside of his family’s compound…or Bowdlerized 1950’s lexicon, for that matter. Yet, without this veering into “The More You Know” territory, the duo learns that neither Archer’s dogmatic beliefs nor Armstrong’s (or Aram Anni-Padda, to the sticklers) world-weariness has a monopoly on the truth. Guns, blood, explosions, fire, the shattering of glass, and a hefty body count. Yup, that’s good old Bloodshot. But Bloodshot? Bloodshot struck me as a zeitgeist of a past era, one obsessed with films where a white American male killed all the baddies, saved all the hostages (one of which usually/always happened to be an attractive female doctor/reporter) and “solved” America’s problems abroad to the syncopated tune of shell casings. It’s just that neither Segal, Norris, or Van Damme were quite as pale as the protagonist in question. That’s Jeff Lemire’s verbatim response to the question that begins the issue, “Who was Bloodshot?” Swap out the pronoun for another in this inquiry made by “the man previously known as Bloodshot,” and it becomes a meta-commentary of sorts on the series’ previous incarnations. Valiant’s Bloodshot was a hyper-violent revenge narrative led by a tough looking anti-hero sporting a moniker meant to be taken equally seriously. When it got rebooted, it was a fun, popcorn-y book, albeit one that felt tonally disparate from Valiant’s other titles. While Valiant’s other books managed to juggle action elements alongside sci-fi, buddy narratives, comedy, supernatural, historical, and other genres, Bloodshot just burrowed deeper into being the bloodiest, goriest and explosion-fueled book in their stable. 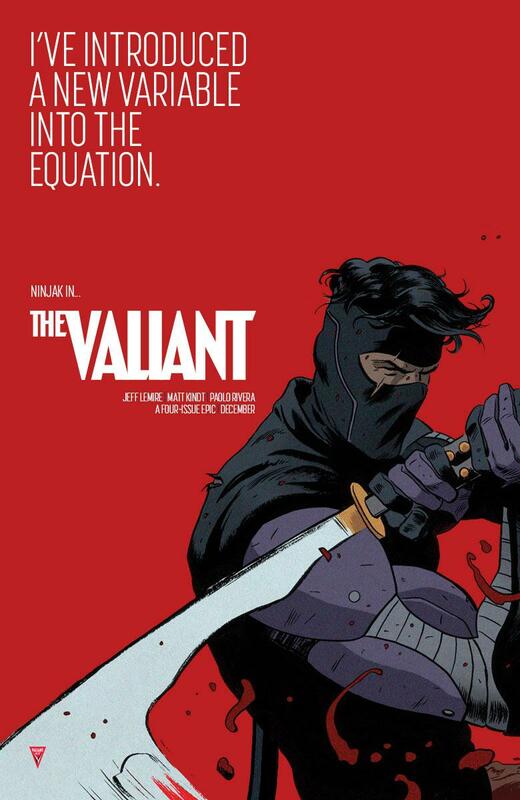 It has occurred to me that perhaps Valiant knew all of this from the get-go. Perhaps they were aware that Bloodshot didn’t exactly have much in the way of a personality, or that anywhere he wasn’t clutching an MP5 in his hand and a hole in his head, he seemed woefully out of place. But just how funny or wise or sarcastic or quirky can an amnesiac murderbot programmed by Uncle Sam be anyway? Perhaps they knew that several years down the line, they would finally have the opportunity to “flesh out” their pigment-bereft dealer of death in ways that wouldn’t involve depleted uranium rounds. Maybe they even subconsciously planted the idea in Jeff Lemire’s mind years ag—. However it happened, Jeff Lemire was effectively put in charge of Bloodshot when he co-wrote the four part miniseries The Valiant with Matt Kindt earlier this year. Valiant readers, new and old alike were introduced to our favorite pretty pale pugilist (can you tell I’m running out of puns? Because I am.) and really made us feel for our nigh unkillable hero. Hell, we even thought there might be love in the air the way that greenhorn Geomancer Kay McHenry got his nanite-infused blood pumping. Alas, Bloodshot made the mistake of making a promise to Kay, one that Eternal Warrior had never successfully kept to any of umpteen geomancers that preceded Kay: that he’ll keep them safe if the Immortal Enemy returns. Miss McHenry does not turn out to be the outlier either; the Immortal Enemy mortally wounds her, but not before she utilizes her powers to remove the nanites from Bloodshot, effectively rendering him human. Of course, Lemire masterfully condenses over twenty issues of Bloodshot and the events of The Valiant into the opening four pages of Bloodshot Reborn #1, closing on the thought that “Bloodshot is gone…and I’m all that’s left.” It’s a deft opening move on Lemire’s part, stripping the protagonist of the powers that arguably constitute all that was his identity or “self.” Furthermore, it’s a clever inversion of the usual superhero origin: individual goes about their usual everyday life until something truly extraordinary transforms them into a previously unknown state. Yet here, Bloodshot is unwittingly thrust into an “everyday life,” one that is quite foreign from his usual regimen of being turned into the human equivalent of Swiss cheese week in, week out. So instead of smash-cutting to a parachute drop into a war-torn country, or a full frontal assault on a secret underground base, Lemire dumps us into the middle of Nothingtoseehere, Colorado. Six months have gone by since Kay left Bloodshot with the fairly non-refundable gift of humanity, and inasmuch as one needs a little R&R after preventing the world from plunging into darkness, he’s not exactly “living it up,” at some all-inclusive resort either. 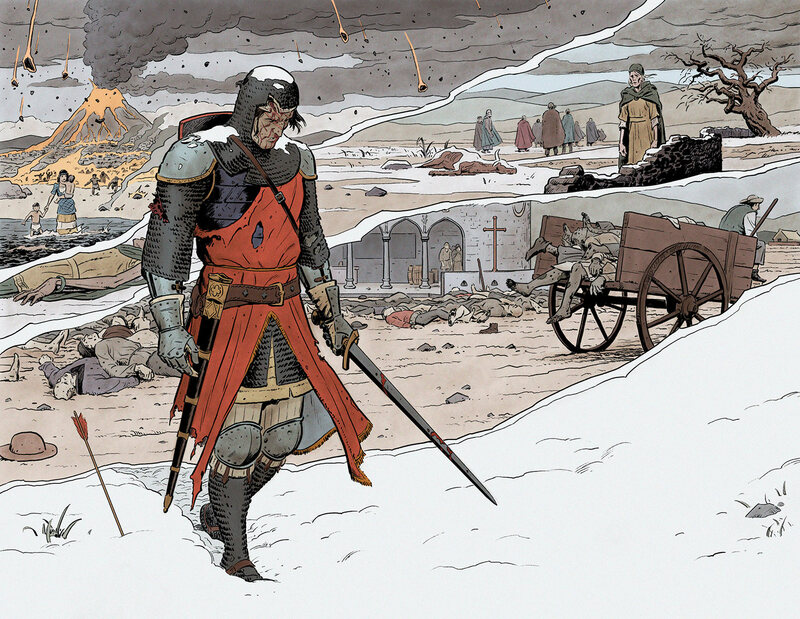 David Baron’s color work is absolutely stellar, evocative, and haunting. Instead, we find him working as a handyman for a roadside motel, the sort that uncomfortably hovers between one star, and cobbled together fractions of it. In exchange for unclogging toilets and replacing burnt out bulbs, Bloodshot’s room and board is taken care of. Not that he’s going by “Mr. Bloodshot” these days, anyway. Instead, people know him as Ray Harrison, a pseudonym he begrudgingly cribbed from the Rolodex of aliases Project Rising Spirit assigned to him. Ironically, Lemire has Bloodshot shackle (or is it anchor?) himself to this past identity even when he’s no longer beholden to PRS’s duplicitous simulation. I mean, where exactly are you in life when you have it resembling something you’re aware never existed in the first place? Now, lesser writers might quiver at the thought of masochistically painting themselves into a corner occupied by a mopey and powerless man. A man, whose greatest fear is the return of said powers, and not their permanent absence. 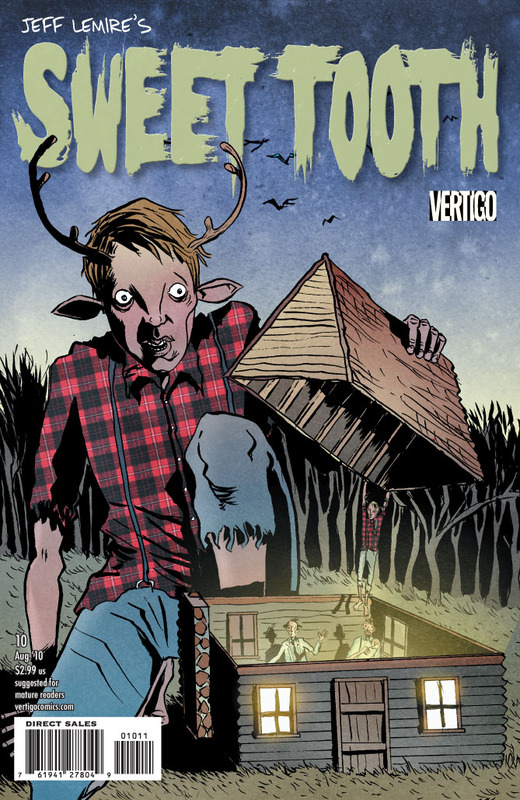 But Lemire’s perfectly comfortable delving into character studies over hard-nosed plot, with titles like Sweet Tooth and Essex County attesting to such. So he lets “Mr. Harrison” stew in his muddled mess of emotions, memories and feelings…some real, others just masquerading as such. Suayan’s heavy shading on the sheets and unkempt laundry really give the panel a world-weary feel. While Lemire grew up in close geographical proximity to the United States (a forty-five minute drive from Detroit) his upbringing itself was Canadian in nature. I bring this up because I suspect his perspective as a familiar, yet outside observer of American culture allowed him to hone in on the pervasive element of violence present in such. 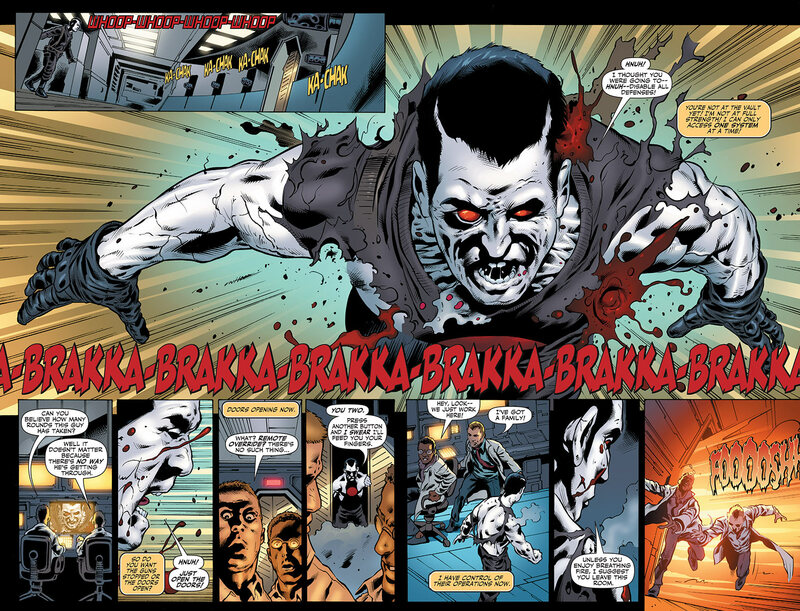 While Bloodshot might be thousands of miles away from the war zones and disputed territories that made up his previous gore-drenched existence, there is no escape from that which is ingrained in the TV shows, films, video games and the 24/7 news networks of America. These ubiquitous triggers bring about violent recollections of past actions in the waking hours of the individual, that for sheer reasons of ease, I’m still going to refer to as Bloodshot. 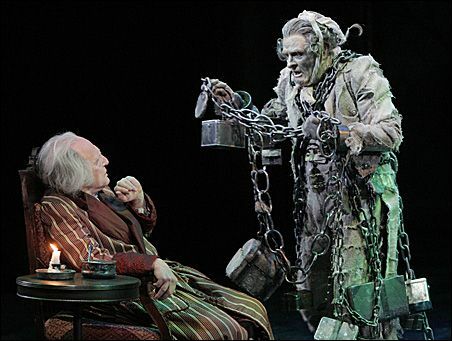 Those hoping he’d find a sweet reprieve from such in the nocturnal embrace of Morpheus discover that his evenings are more in line with those of Ebenezer Scrooge on the twenty-fourth of December. Heeeere’s Bloodshot!!! He’s drawn by Jeff Lemire, for those that don’t recognize his style, and I absolutely love the meshing of the contrasting artists. Without giving too much away (I know, it’s me, right?) regarding these specters, I absolutely adore Lemire’s contribution to the Valiant Universe of Bloodsquirt. This pint-sized emulation of Bloodshot draws more than a faint resemblance to Bat-Mite, a once forgotten remnant of one of the Caped Crusader’s goofier Silver Age adventures. As he is wont to do, Grant “Better Head Over To Wikipedia” Morrison resurrected the largely unknown character as part of his “The Black Glove” arc on Batman, and attentive readers will recall that this itty-bitty winged Dark Knight dropped in at a point when ‘ole Brucie’s not exactly at his bravest or boldest…or sanest, for that matter. With a similarly miniaturized appearance, and a disgustingly exuberant attitude of one that just wants to “get to the bloodbank and fire up the bloodmobile,” one’s left wondering just how far the comparison extends between the two…to say anything more on the topic of coincidences would be to give too much away. For all the introspection and questions of identity formation, Bloodshot Reborn does eventually reach a “call to action” moment. A nearby tragedy (one that bears a chillingly unmistakable resemblance to a real life one in Colorado from several years back) forces Bloodshot to reconcile his unwillingness to embrace any aspect of his past identity, with that unfortunate realization that if he won’t, there’s a good chance someone else will. Now, I’ll be the first to admit that, as solicits and previews rolled out, I didn’t think Mico Suayan was the right fit for this new take on Bloodshot. His work seemed to lack the raw, scratchy energy that Trevor Hairsine brought to Bloodshot: Armor Hunters, or the bright and clean approach that Manuel Garcia took with the initial issues of the reboot. However, Lemire has a knack for being paired with artists that are perfect for his take on characters, even if they may seem unconventional for said character in general. Personally, I can’t fathom Lemire’s run on Green Arrow without Andrea Sorrentino’s truly “out there” style, or his breakout hit, Animal Man sans Travel Foreman’s “made for horror” pencils. While I really enjoyed Trevor Hairsine’s take in Bloodshot: Armor Hunters, it wouldn’t be the right fit for this book. In the same vein, Suayan might not have been the ideal penciler for the rebooted Bloodshot title, but as I found myself landing on the final panel, there was no doubt in my mind that he was perfect for Bloodshot Reborn. While some might compare his shade-heavy style to that of the legendary Brian Bolland or his fellow Brit Andy Clarke, Suayan’s technique is more realistic than stylized. Admittedly, hyper-detailed art that leans towards photorealism isn’t usually my cup of tea; I don’t need to be able to identify every individual muscle in a flexed arm, or take a crack at the thread count of the protagonist’s sheets…but that’s just me. Yet with Bloodshot Reborn, Suayan’s undoubtedly time-consuming style (and if it isn’t, you’ve just incited the wrath of umpteen pencilers) is not largely spent sketching out splash pages laden with explosions and high-octane gunfights. Instead, it’s poured into an unrelenting portrait of a directionless existence, one consisting of wrinkled clothing, pizza boxes, and trash bags. Normally, these are the sorts of peripheral details in a panel, the ones that are loosely sketched with rough shapes and where squiggles standing in for actual letters of the alphabet…here they’re an “in-focus” testament that the everyday has taken center stage, and it’s difficult to digest. Who knew the pastoral life was such a nightmare? Without a doubt, Bloodshot Reborn will have its detractors. There will be those that question how a book that lacks the titular character, let alone one desirous of becoming him, can hold such a title aloft. And there will be those that question the meditative pacing of the title, in addition to its introspective nature. They’ll probably want to know why it doesn’t largely consist of an oversized albino man, sporting what would otherwise be life-ending injuries, alongside firearms that certainly could not be concealed nor carried, without some difficulty. Suayan’s cover wasn’t designated the “Main” one for Bloodshot Reborn #1, it’s not hard to see why it’s the one I ordered. That being said, I understand that familiarity does not breed contempt for all readers. Nonetheless, Valiant has had the courage to simultaneously humanize Bloodshot as a franchise, as well as within the confines of this story arc. 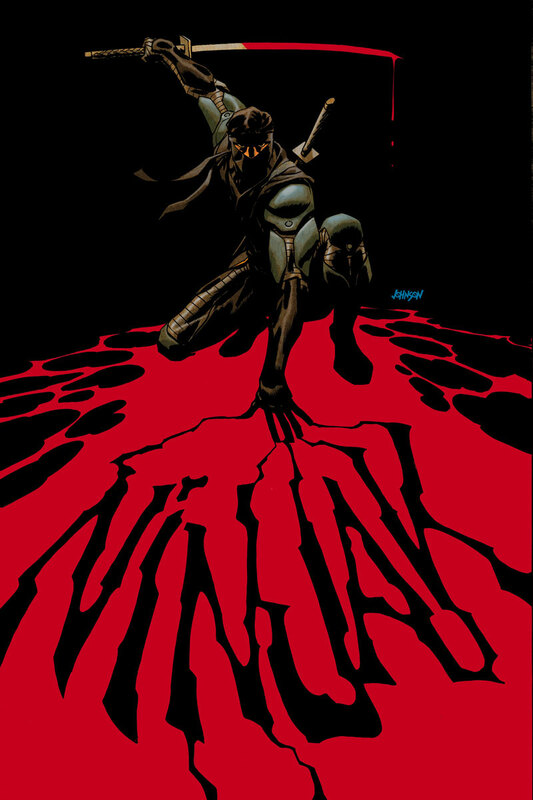 In doing so, Lemire and Suayan have masterfully lit a fire under the feet of their presently mortal protagonist, (which now seems like a poor choice of words, given his current state of vulnerability) and questioned if beyond the powers, beyond the iconography, beyond the legacy, Bloodshot can make the choice to become a hero. Those looking to read a carefully handled reinvention of a semi-stagnant character should look no further. Why? It’s because Bloodshot Reborn puts on a clinic on how it’s done, and readers that aren’t dogmatically driven by static, unchanging portrayals of what a character “should be” or how a character “should act” will deeply appreciate a comic that could have rested its laurels at the status quo, but chose not to. Jeff Lemire and Mico Suayan dare to reinvent Valiant Entertainment's action star Bloodshot, following his de-powering at the end of The Valiant. It's a "real world" narrative that successfully asks some tough questions about identity formation, and grounds itself in Suayan's gorgeously hyper-detailed art. Growing up, Nick White dreamed of a career with the Chicago Bulls. This is because he was young and stupid, and his parents were of the "you can do ANYTHING" mentality. When he was older, and probably not a whole lot smarter, Nick purchased Alan Moore's From Hell on a whim (that in itself probably says a lot). He was astounded to find that comics were as bizarre and twisted as his beloved Twin Peaks. After that he bought Batman: The Black Mirror strictly on the cover's aesthetics (Who the hell is Scott Snyder?" he said) and hasn't looked back since. Except, of course, in situations that necessitate such. When he's not "busy" playing Castlevania or harassing Zander about what he ought to be reading, Nick continues to work on his makeshift shrine to Jeff Lemire.